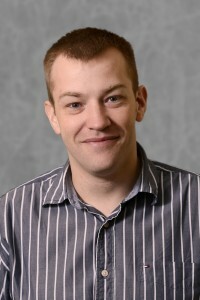 Dr. Michael Timmers works as a joint academic-industry postdoctoral research associate with the Plants for Human Health Institute (PHHI) and Dole. He is based in the lab of Dr. Mary Ann Lila, PHHI director, but also serves as a research interface with Dr. Nicholas Gillitt, director of the Dole Nutrition Research Laboratory. With expertise in high-performance liquid chromatography (HPLC) and nuclear magnetic resonance (NMR), Timmers is a key component in this program of collaborative research. In Lila’s lab, he is exploring fruits like cranberries, blueberries, raspberries and mangoes as potential Nutrasorb™ products. Nutrasorb is a natural foods technology developed by Lila in partnership with Rutgers University that infuses the phytochemical content of fruits and vegetables into a protein powder. The powder provides a shelf-stable functional food ingredient that can deliver the health-promoting properties of fresh produce without the sugars and bulk. Timmers assists Gillitt and Dole with profiling bananas using NMR and HPLC to identify new compounds. Banana peels have a very high phenolic content compared to the flesh and the antioxidant and phytochemical compounds may provide health benefits to humans. Timmers is working to identify those compounds, find out how they vary with the ripening stages of bananas, then establish a method to extract and use them in a packaged food product.